After the opening of the Magic Kingdom (Lake Buena Vista,FL) in 1971, there was a lot of demand for a thrill ride there. Disney had misread the guests that came to the park; They were forecasting a lot of seniors and families with very young kids, but, young adults and teenagers came in higher numbers. Disney had to scramble to fill that need and they turned their eyes toward Space Port. Interestingly, at the time, RCA Victor was interested in sponsoring a Disney attraction. After a failed sales pitch to the CEO, they finally got them onboard after a second try and thus, Space Mountain presented by RCA Victor was launched. 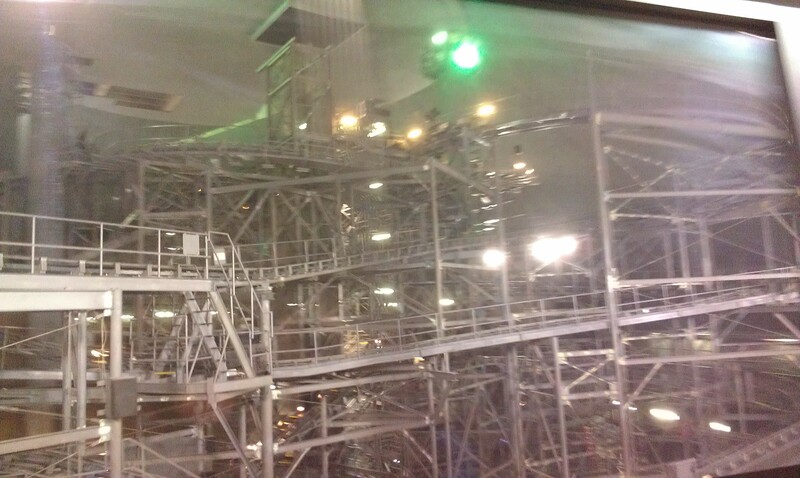 The ride also took a different shape, as the rainy Florida weather was not conductive to an outdoor coaster that relied on friction brakes and speed adjusting rubber tires. So, Arrow Development was dropped out of the project and the project now housed entirely inside its custom show building. That unique building is shaped like a raised cone and to provide a perfect show surface inside, the support columns are outside. The dome interior is smooth inside. View of the Mountain from outside the park berm. The mountain is over 180 feet tall and is 300 feet wide. It was constructed between the Walt Disney World Railroad track and the Contemporary hotel and a tunnel was built between Tomorrowland and the mountain. Initially, a Goodyear Speedramp was to take riders between the tunnel entrance and the mountain, but operationally, it was impossible. If there was an issue loading guests, there would be safety issues due to the guests being forced into the loading area. The Speedramp was kept, but instead used for the exit tunnel. A look at the Mountain from Tomorrowland. 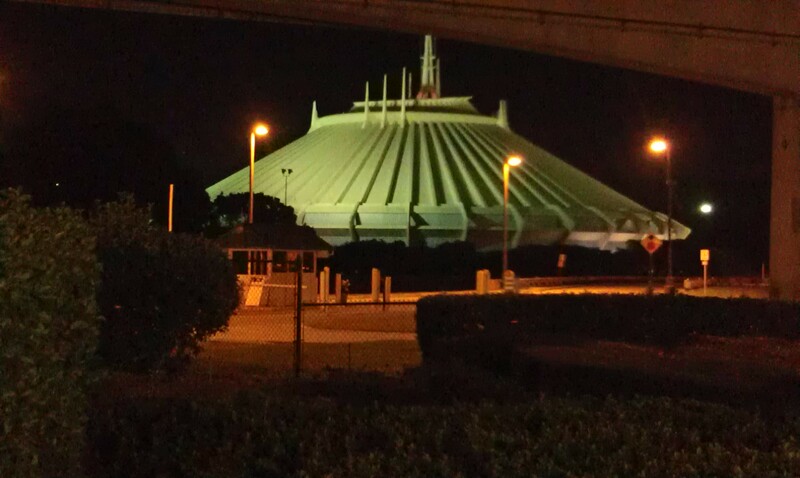 The mountain with the Peoplemover roof on the right side. The Peoplemover tracks head into the mountain at this point. How was this the largest expansion at the Magic Kingdom? At the time, Tomorrowland had quite a light attraction offering and really had four attractions in 1971: the Circlevision theater in the south show building, Flight to the Moon in the north show building, the Skyway to Tomorrowland and Grand Prix Raceway (since renamed the Tomorrowland Speedway). In 1972, a dark ride called If you had Wings opened, but did not really expand the footprint since it was built in an extension of the south show building. Walls still surrounded the Skyway station and there was still not much to do. In 1973, construction accelerated as plans were finalised and by 1975, Tomorrowland was fully fleshed out with the addition of the WEDway Peoplemover, Astro Jets in the central tower, a new theater and the Carousel of Progress on the right side. 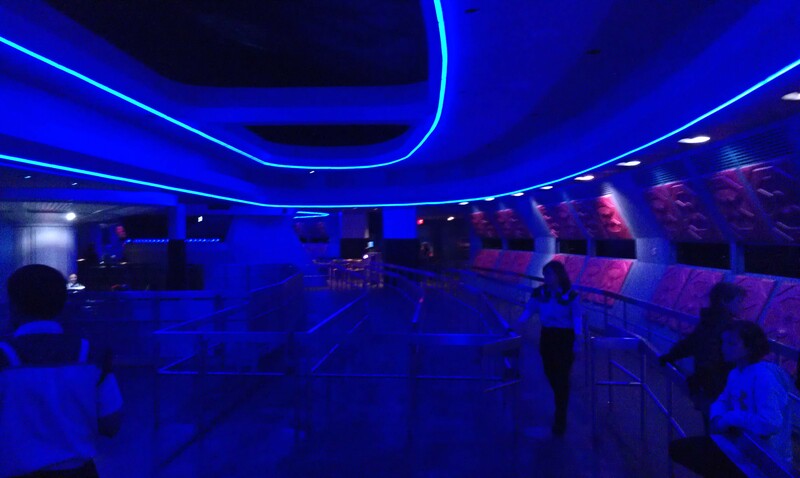 Sitting at the end of the land was the new king of the Magic Kingdom, Space Mountain. It added incredible capacity to the park and finally gave the park the thrill ride it needed so much. The main designer of the ride is Disney Legend John Hench. He was assisted by Marty Sklar and in charge of the track profile and rocket design was William Watkins, the head of mechanical engineering at the time. William Watkins used his experience as an airplane pilot to design the ride layout, trying to make it the smoothest experience possible. Unfortunately, the quality of fabrication for the in-house style Arrow Development style track was not perfect and it motivated Mr. Watkins to look for an alternate track style for the next installation. The ride feature two tracks with each having a 90 feet tall chain lift hill at the start and a smaller lift hill between the unload and loading stations. The ride layout includes 4 drops, with the largest dropping rockets 30 feet at a 39 degrees angle toward the end of the journey. It originally ran trains of two rockets with two seats each. Each seat was designed for two travelers in a lap sitting position and seatbelts made sure the riders remained seating through the whole experience. In 1989, the rockets were changed and introduced 3 individual bucket seats per car. A U shaped ratcheting restraint replaced the seat belts and that lead the ride to now feature a 44 inches minimum height restriction, versus 36 inches originally. In 1998, the rockets were again replaced and those padded seats and T shaped restraints appeared. Notice the little cargo pocket on the side to accommodate loose items. 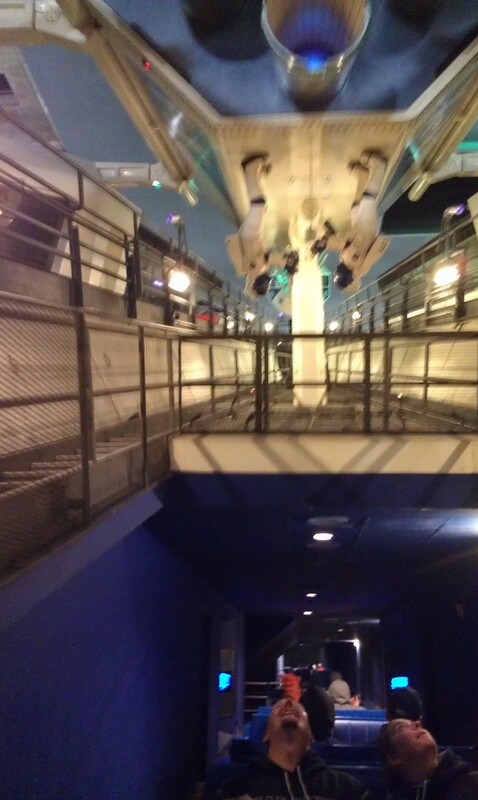 The Peoplemover goes in the middle of both lift hills and you can see the starship suspended in the lift area. 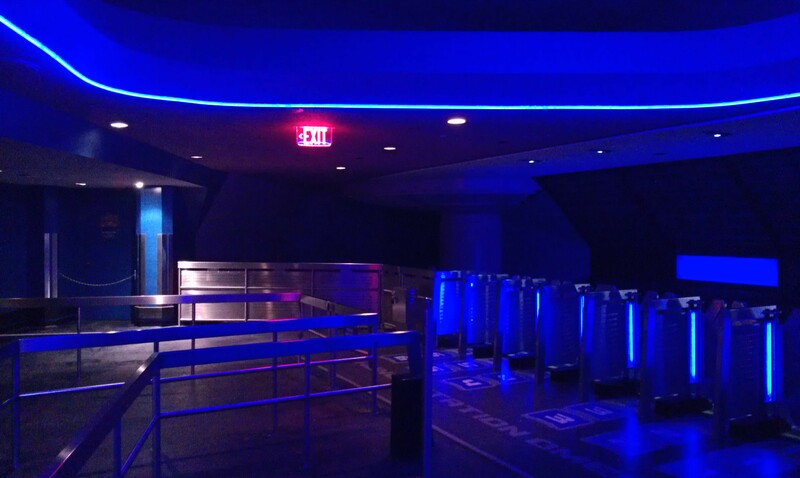 The experience feature a themed launch tunnel, where blue strobe lights and sound effects give the illusion of going through a blue nebula. A mirror give the illusion of running toward another rocket and a sharp 180 degrees turn takes the rocket up the main lift hill. That lift hill feature a launch control center at the bottom and toward the top, we are in space and are released in a dark environment. The smooth surface of the dome lead to projections of flying meteorites and fixed disco balls simulate star fields. 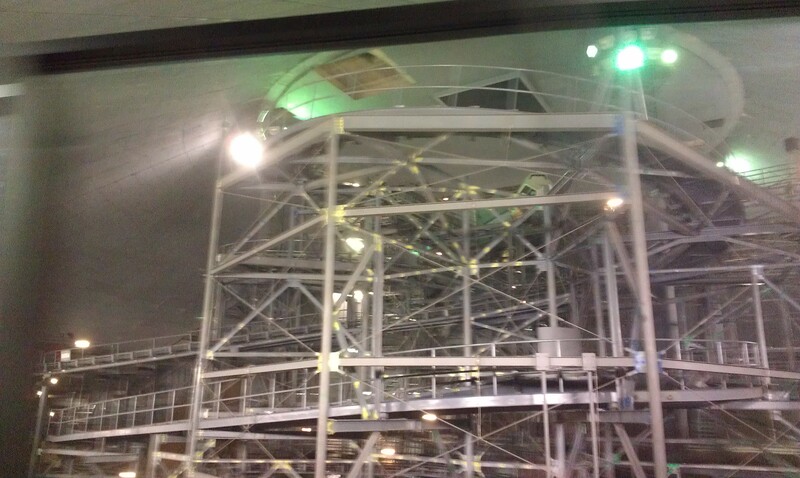 Those two pictures show the incredibly tight ride structure inside the dome. Notice though that unlike the later Space Mountain, there is still a lot of open space inside the mountain. 2009 saw a major refurbishment to the attraction. While originally new track and reinforced supports were to be installed, the rehab was cut in length and the original track was smoothened and some track sections replaced. Most of the planned new effects were never installed and the only major change on ride was enclosing the station area, thus making the ride area darker. For that purpose as well, the rockets were repainted and the glow in the dark strips removed. 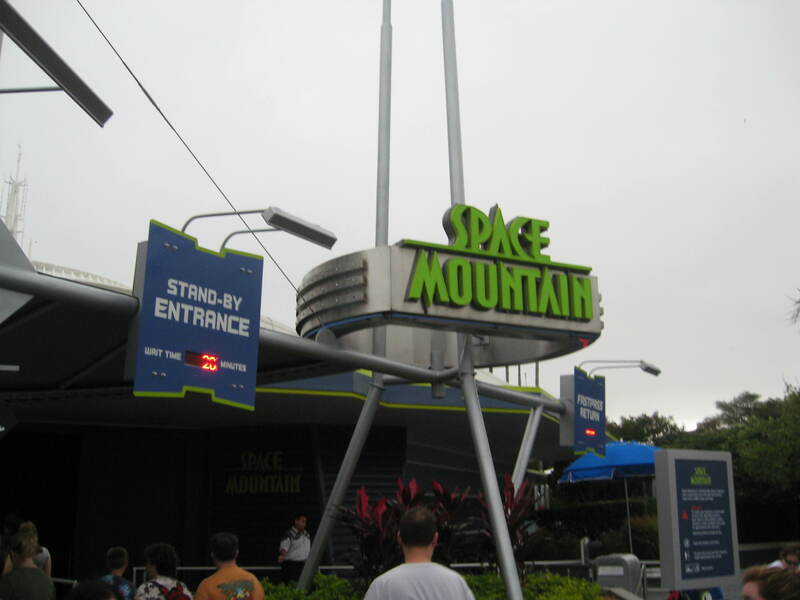 In 2010, “Starry-O-Sonic” sound was added to the mountain, using speakers installed around the track. The track is a roughly a 3 minutes remix of the 2005 Exit Music. The entrance sign color was changed to green, along with the accents on the signage. The post 2009 loading area. Notice the new ceiling and lighted air gates that were added. Another view at the ceiling with the blue lights. The post 2009 loading area. Notice the 1980’s operator consoles still used at the attraction. 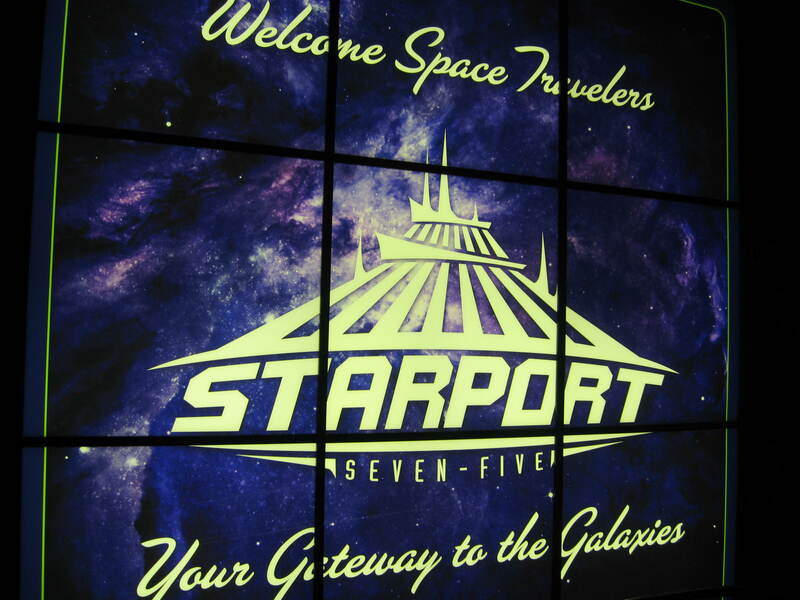 -HK Spaceport E-TKT (Hong Kong Disneyland installation, the E-TKT refer to the original Disney ride ticket system). The list of Active Earth Stations. The welcome sign in the first room of the waiting line. The Tomorrowland Station MK-1 name is referenced in the unload areas. Now that both tracks have a formal name, the unload areas are now referred to as Alpha Lounge and Omega Lounge. 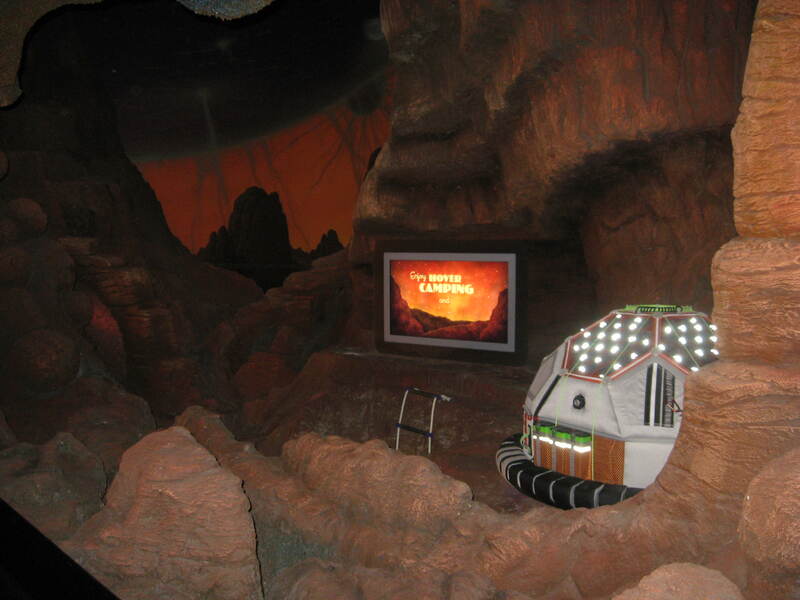 Those two pictures show the 2009 post show, showing off futuristic vacation spots. 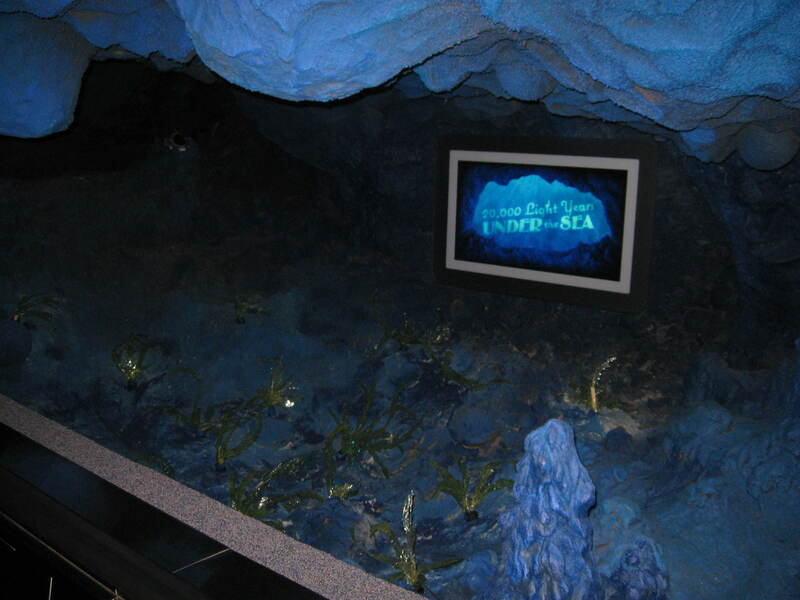 There is an hommage to the 20000 Leagues Under The Sea attraction as well. This entry was posted in Coasters and tagged Disney World, enclosed coasters, Magic Kingdom, Space Mountain. Bookmark the permalink.